Although this would be our first entry in the dev blog talking about Trespassers, we have been working in the game for several months right now, although not full time though. As we are approaching our Steam Greenlight release, we are focusing on polishing things that were working in previous events, but needed a bit more work. In this case, we are talking about the top down levels. Our idea is to get 3 different districts to play in, each one controlled by a different faction (although this is planned for a future update). 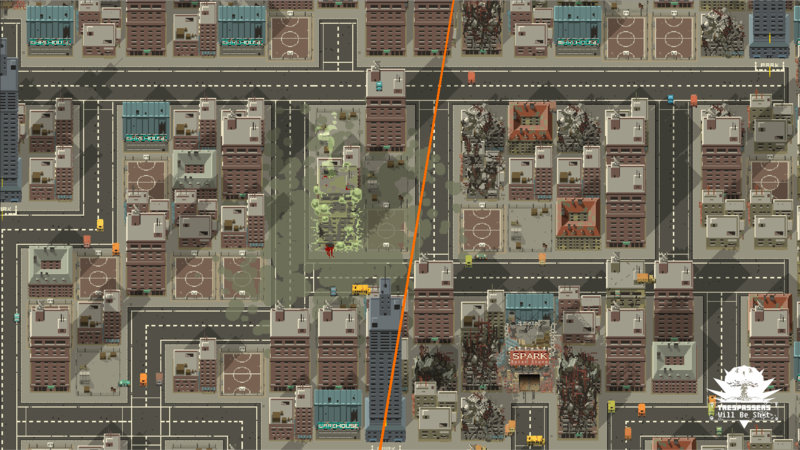 You travel across the entire city in a vehicle, like a pick up or a tank, fighting the hordes that are scavenging the district, while finding missions to make your characters progress further, and accomplish more goals towards restoring the world as it should be. Our problem in past demos was that the visuals were a bit repetitive. We didn’t have enough time to add more content, but now things have changed a bit. Here is a pic below to check differences between previous (left) and current (right) versions. As you can see, we added more variety to the buildings, and, although not yet implemented, there will be more buildings that players can destroy. In the previous iteration we added some more colors to the scheme, to help distinguish one another and avoid repetition. Back to the destroyed buildings, our plan is to have lots of destructible buildings, which will give more freedom to players as to how to transverse the whole district. This will help shaping small areas that could help players avoiding the enemies, thus adding a bit more variety to the play style. 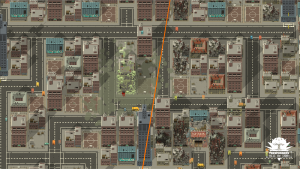 We are still considering if debrish should slow down the vehicles, so even if the players are reshaping an area, the cannot take so much advantage after all. Now, time to get back to the code!